can I sell this scriptlet for $0.99? Disclaimer: This is not how Source Explore works. I did not even buy, try, pirate, or do anything with this app. Note 2: Please also check http://iphonedevwiki.howett.net/index.php?title=Xcode#Developing_without_Provisioning_Profile. After doing this, you can't use entitlements with Xcode anymore. But you have ldid -Sxyz.xml that does the same job. There is no Hybrid mode in Maps when GreenTea is on. Today I was making the API for GraphicsServices, and found something... interesting. Since 3.0 it was "well known" that there is a mysterious capability called as "Green Tea". Nothing was known except for this funny name. Things start to get clear in the 3.1 firmware. The GraphicsServices of 3.1 has a new set of API for querying some properties of Maps and MapKit. Strangely, in the disassembly of these functions, the mysterious "Green Tea" capability was refered, e.g. It means the "Green Tea" capability is related to Maps, and takes different default values. No big deal right? 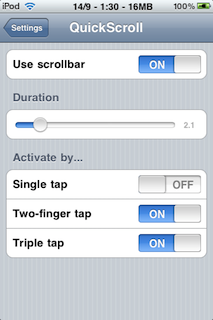 QuickScroll 2.2a should be available on Cydia soon. QuickScroll 2.2 2.2a is released, and this marks the completion (so far) of the QuickScroll project. Thanks to the gdb for 3.1 I've finally squashed the "HiCalc" bug. I have already submitted it to BigBoss and should be available in a day. If you can't wait, you can still download from here. The scrolling indicator is no longer visible when scrollbar is used. 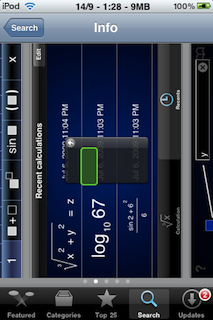 You should be able to use the scroller in HiCalc and other apps that canCancelContentTouches. Fixed an obscure bug that causes crashing when the scroll view disappears. Thanks Optimo for discovering. The gdb on Cydia currently doesn't work on 3.1 because of the new Mach-O format. We could compile gdb from source (which I've failed to do so), wait for someone else to compile from source (which I'm still waiting), or just use the gdb in the SDK. Update: saurik has updated the gdb package that works in 3.1, which will be available tomorrow. You can download it now from http://apt.saurik.com/debs/gdb_1128-8_iphoneos-arm.deb. , and the gdb should now be completely usable on the iPhoneOS. Fixed a bug in characters sorting, that the sorted array is incorrect (r499). 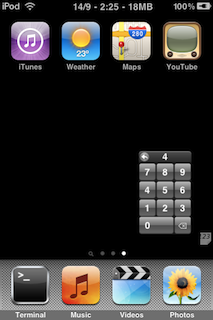 QuickScroll can be disabled for each particular app, including SpringBoard. New icon design by Sagitt. After this release all features will be frozen. That is, no new features will be accepted, no matter how ingenious it is. (Ya know, this thing gotta be pushed out some day). Only bug fix and new localizations will be allowed for 2.2 (the public version). The scrollers should now be easier to grab and move around. Duration now really defaults to 2 seconds on first install. Thanks fusen for noticing. Scrollbars can be chosen to jump on spot instead of next page. Thanks Sagitt for suggestion. With a 333% size increase*, QuickScroll 2 is released to improve the scrolling experience. QuickScroll 2 now introduces scrollbars, which is the default. Besides PDF files, scroll views that explicitly allowed for paging can also be targeted. The old scroller is still accessible, but you can now move it around (and occupies much less space). These configuration can be set in Settings. As you can see, there are 2 more gestures you can choose. The two-finger tap should allow you activate QuickScroll in a table view easier. I've eliminated the close button. The scrollers will disappear in 2 seconds of inactivity. QuickScroll's scrollers are now actually a subview of the scrolling view, while in the 1st version it is an alert box. This change allows QuickScroll to be used in very high-level windows like those in SBSettings and GriP. I don't know how to localize PreferenceLoader entries yet. So no localizations in this version, sorry. *: 24 KiB → 104 KiB on disk. The result will be very verbose, make sure your terminal has enough scrollback. Fixed issue 313. In an alt (numbers) plane, pressing the space key will go back to the main (alphabets) plane. Typing the apostrophe (') in the main plane no longer auto-switch to the alt plane. Fixed issue 312, and many other auto-shift related quirks. Number of candidates is limited to avoid near-infinite loop. 64.0 candidates should be enough for everyone. Fixed cases where blank candidates appear. Candidate searching now operates in serial for reliability. You may experience some degrade in performance. A progress indicator is added when the Patricia tree dump for the IME was first generated. 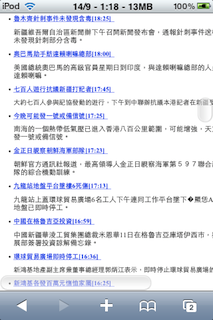 This is essential for some huge IME like 輕鬆輸入法, which takes nearly 2 minutes for the first launch. By the way, if you find any bugs, please report at Issues in the project page. If you leave a comment here or the wiki I can't guarantee I can dig and fix that. Preemptive Warning: Comments not related to this content will be ignored. Introducing Subjective-C, an objc_msgSend[_[st|fp]ret]? logger. Time ago I logged calls to objc_msgSend to understand how to construct UIKBKeyboards. But that logger is known to cause problems due to asserting the arguments use less than 1024 bytes. I needed to log calls again for issue 312, but the old buggy behavior leads me to rewriting it more reliably. Stack-safe. No arguments will be lost due to this logger. Print and format all arguments, and the return value. Due to licensing, only the ARM version is released, although the x86 version works perfectly. If your product depends on Subjective-C (why? ), please note that it is GPLv3. -[NSCFDictionary objectForKey:] <0x100af10> (@"CFBundleIdentifier") = @"com.yourcompany.Untitled4"
-[NSCFString description] <0x100adb0> = /*self*/ @"com.yourcompany.Untitled4"
Downloads can be found in here as usual. You can now long-press control keys (left, right, etc) to repeat actions. ANSI and X11 apps for control keys are now correctly detected. PSBundle for layouts and IMEs. Normal users can find them in Settings → iKeyEx → Customize. In the delete cache page, the total file size of the cache entry will be reported. Candidate calculation in .cin IMEs now actually runs in background. Associated phrases (aka Completion) can be disabled. iKeyEx-KBMan now registers input modes correctly without causing crashes. Also it now purges layout cache correctly. The "h" version of iKeyEx is considered a release candidate. I'll try to get it to BigBoss's beta repo if no major bug is found. You'll find that the Tab, Esc, Page Up keys etc become words instead of symbols. This is because, with the system fonts all the previous symbols cannot be rendered. For consistency I just change them all into words. The "Autocorrection" part of the old pref bundle is now handled by Mix & Match. Sometimes your customization won't take effect. Try to Delete cache if that happens. There are no modifications other than these.